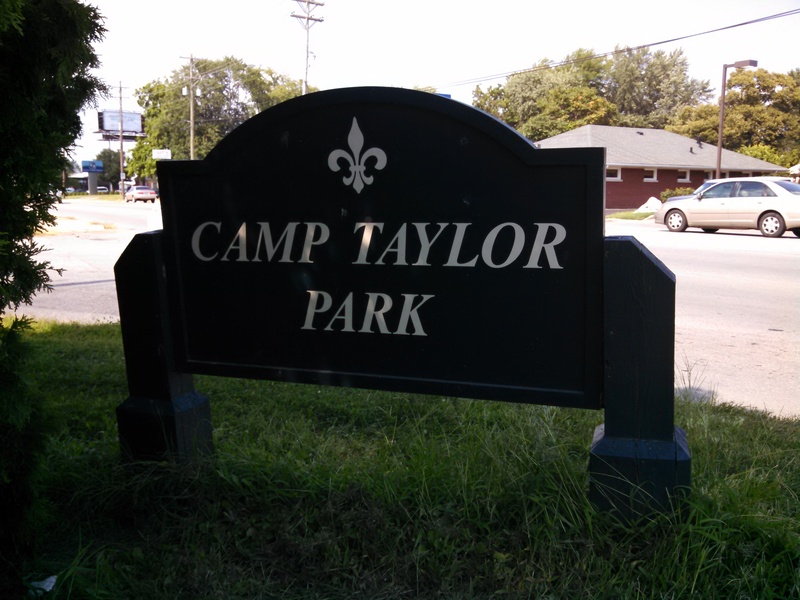 Camp Zachary Taylor Memorial Park is located on land where the World War 1 army training facility was built in 1917. The park lies diagonal from where the Headquarters Buildings stood and where some of the Barracks, the PX Building.and the YMCA offices. 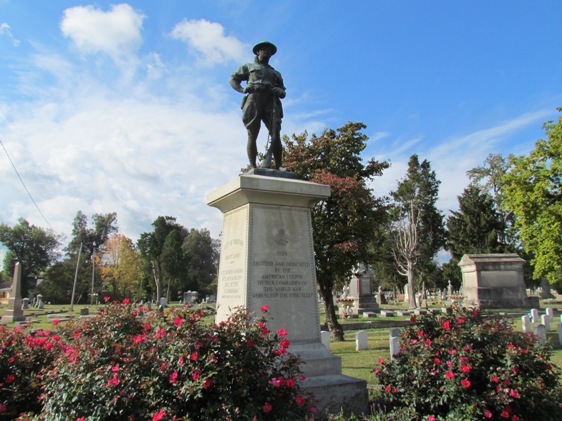 Description : Paducah has a World War I monument in Oak Grove Cemetery. The monument was erected and dedicated in 1928 by Paduke Post 31 of the American Legion. The bronze monument with a granite base was designed by sculptor John Paulding, cast by the American Bronze Company, and erected by the Beasley Monument Company. The inscription on the front of the monument reads: 1928, Erected and dedicated by the American Legion to our comrades of the World War who sleep the long sleep. One of the monument’s sides has the inscription: When to the last assault our bugles blow: reckless of pain and peril we shall go. Heads high and hearts aflame and bayonets bare, and we shall brave eternity as though eyes looked on us in which we would seem fair. The other two sides of the monument recognize the Paducah Mayor, City Commissioners, McCracken County Judge, and County Commissioners. The "Naturalization Tree" was a sprawling North American Ash Tree, that once stood along Lee Avenue, near Grove Avenue. It was located approximately 300 yards from this new site. It was a mature tree that stood for many decades after World War 1 ended, until it was struck by lightning, and unfortunately, had to be taken down. All that remains of this famous tree is this marker. It was erected by the Fincastle Branch of The Daughters of the American Revolution, and first dedicated on November 11, 1921. The history of naturalizing foreign born citizens after enlisting in the US Armed Forces, began during the American Civil War. "The Congressional Act of 1862” permitted “Any Alien of the age of 21 and upwards, who has enlisted, or may enlist in the armies of the United States during war time, upon honorable discharge shall be admitted to become a citizen of the United States”. At the onset of the US entering World War 1, Congress passed the Naturalization Act of May 22, 1917, which amended the 1862 law to read “Any Alien who may under existing law, become citizens of the US with 1 year of Military Service”. The preceding requirement was 4 years’ service. However, it specifically excluded this right to all those of Asian descent. The “Act of May 9, 1918” again amended the law "to provide immediate naturalization of alien soldiers as US citizens upon enlistment, and was also expanded to include Filipino and Porto Rican nationals. It was not until “The Immigration and Naturalization Act of 1953” that all Asian’s were granted this right. The large ash tree was selected as the location for the swearing in ceremonies by Lt. Perkins the Naturalization Officer and Camp Taylor. He said he selected this site "because the men could stand and directly face the Stars and Stripes that flew over the Camp". We have now re-united the Monument with the Stars and Stripes again, these some 94 years later. On Wednesday, October 2, 1918, at 3:00 pm, 400 alien soldiers at Camp Zachary Taylor, swore allegiance to the United States of America. The ceremony that granted these men citizenship, took place under the crown of the mature ash tree on the slope of Flag Hill. The Ceremony was conducted by Federal Judge, Walter Evans. District Clerk Allie Ronald administered the oath. John Walsh, the alien examiner, stated that "he was well pleased with the group of foreigners, and they showed the making of splendid soldiers". Seventeen nationalities were represented that day. Gilmore Jacob Gayle, a native of Kingston Jamaica, was one of those individuals who received citizenship on October 2nd. He was a citizen of Great Britain, a graduate of the University of Illinois, and he was fluent in several languages. He was the first black man to be sworn in as a US Citizen at Camp Taylor. Gayle was an Honor Graduate of the Field Artillery Officer Training School (FACOTS) that was being conducted at Camp Taylor from June 1918 to January 1919. Shortly after his naturalization as a US citizen, Gayle received a commission in the 814th Pioneer Infantry Division that was based here at Camp Taylor. In Another ceremony that took place on October 12, 1918, 1600 men swore allegiance to the United States of America. It was the largest single group ever naturalized at this camp. From October 2, 1918 to October 12, 1918, three ceremonies were held where 2365 soldiers took the oath of citizenship. Approximately 4000 soldiers were naturalized here in 1918. Of the 546,490 foreign born nationals who were granted citizenship in the USA from 1918-1920, 244,300 became United States citizens while enlisted in the US armed forces. 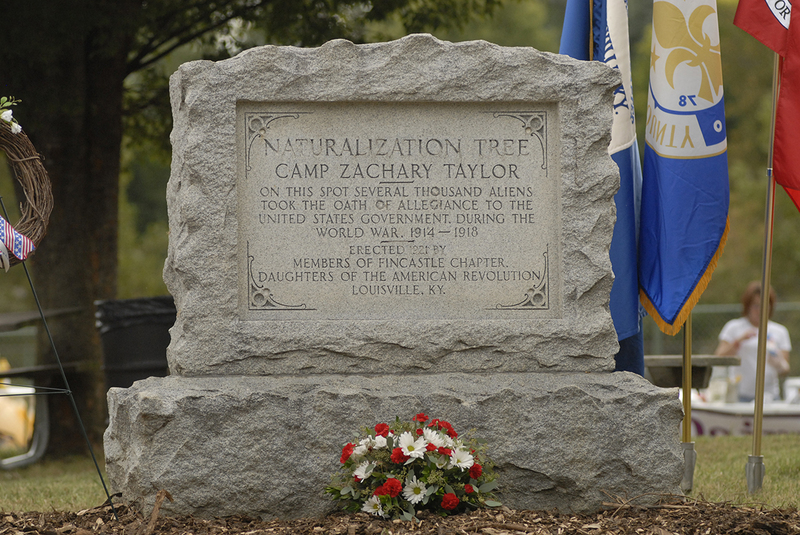 In January 1921, The Naturalization Tree was one of 10 tree's "Inducted into the American Forestry Association's" "TREE HALL OF FAME". It was featured in the New York Tribune, who noted that "The Naturalization Tree was selected because more aliens have taken the oath of allegiance under it's branches than any other tree in the world". The Naturalization Tree was famous all across the United States, if not the free world. I would like to take this opportunity to thank all of those men and women, who from the time of the American Civil War, through the Mexican-American War, World War 1 and 2, the Korean War, Vietnam and up through today, who have placed their lives in harms way, to defend a country of which they were not yet citizens.